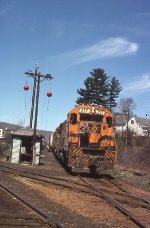 Description: B-11 with 260-257-580 at East End Waterville Yard. Description: The train is now well up on the mountain-side, crossing Frankenstein Trestle. Description: RY-2 is crossing the Willey Brook Bridge approaching the Mt. Willard Section House. Description: Almost there - the train is rounding the shoulder of Mt. Willard. Just ahead is the Gateway at the top of the Notch. 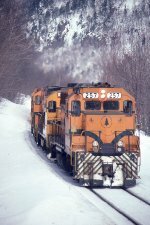 Description: MEC 257 was later CDOT 257, UP 2382, UP 882, GMTX 2101. Date of photo approximate. 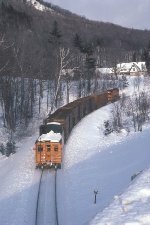 Title: Maine Central Railroad Mixed Freight Train "BR-4", with GE "Independence Class" U18B No. 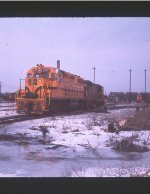 404, "Kenneth Roberts", EMD GP38 No. 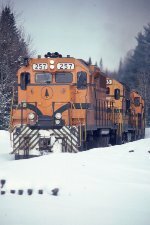 257 and GE "Independance Class" U18B No. 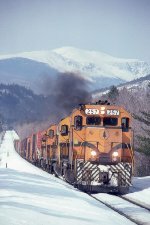 407, "Unity"
Title: Maine Central Railroad Mixed Freight Train, with GE "Independence Class" U18B No. 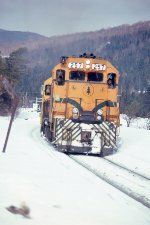 404, "Kenneth Roberts", EMD GP38 No. 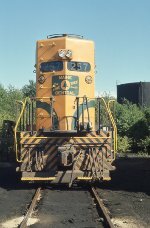 257 and GE "Independance Class" U18B No. 407, "Unity"
Description: MEC 255 approaches the yard at Brunswick ME with a train from Augusta. The track to the left is the Lewiston Lower. Date is approximate.